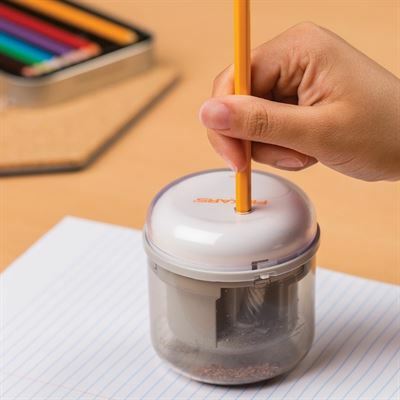 MADISON, Wis. (Sep. 14, 2018) – Fiskars, the World’s #1 Scissors Brand, recently won Learning® Magazine’s 2019 Teachers’ ChoiceSM Award for the Classroom for its Battery-powered Pencil Sharpener. This tool was selected as the very best in classroom-tested, teacher-recommended products. Learning® Magazine’s Teachers’ ChoiceSM Awards are one of the most recognized and prestigious awards in the educational market. This is the 25th annual program and marks the 14th year Fiskars has been named an award recipient. Each year, teachers from across the United States judge the entries based on quality, instructional value, ease of use, and innovation to honor products of exceptional quality and outstanding performance in the classroom. Fiskars is the #1 Teacher Recommended Brand of kids scissors. Known for the Original Orange-Handled Scissors™, Fiskars has a long-standing heritage of quality cutting tools and Fiskars scissors are guaranteed for life. Since its establishment in 1649, Fiskars Group has grown to be a leading functional and living products company with a strong brand portfolio, including Fiskars, Iittala, Gerber, Wedgewood and Waterford. Fiskars Group has employees in over 30 countries and is headquartered in Finland. With over 1 billion Orange-handled Scissors sold, Fiskars has grown to be the World’s #1 Scissors Brand. Fiskars promotes achievement and self-expression by focusing on easy to use, innovative tools to make gardening, cooking and crafting more enjoyable. Fiskars Americas is headquartered in Wisconsin. Please visit www.fiskars.com.